10 1/4 x 9 1/8 x 8 7/8 in. This elegant and powerfully painted vessel was recently created by the master of kutani porcelain, Takegoshi Jun (b.1948). On this square vessel with an upraised neck are depictions of animated blue crested ibises amongst lotus, all created with abroad array of artfully applied, colorful glazes based on the ancient kutani five-color tradition. 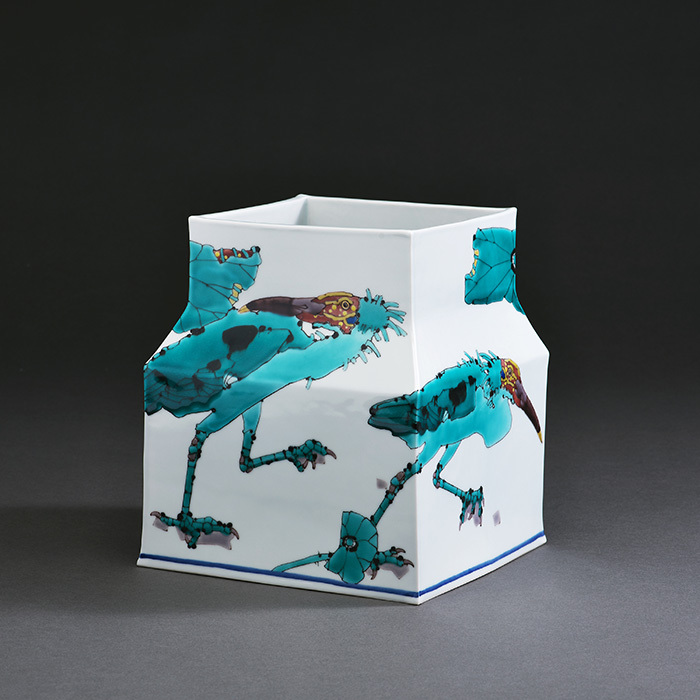 Created specifically for this exhibition, it is one of more than twenty porcelain works by this highly-sought-after ceramist, whose list of international collectors include the Emperor of Japan as well as The Metropolitan Museum of Art. a. 7 7/8 x 11 x 11 in. b. 1/2 x 20 1/2 x 2 3/4 in. 4 1/8 x 10 5/8 x 6 1/8 in. 19 x 21 x 13 in.